Technologically inspired designs and built tough to exacting specifications, the CraigCat® is constructed for a lifetime of fun! Along with the fun comes satisfaction of owning one of the most distinct boats on the water. If you don’t believe us — read what the experts and our customers have to say. TINY CATAMARAN MAKES AMAZING 469 MILE JOURNEY UP MICHIGAN COAST! Few boats smaller than 20 feet are considered capable of undertaking a 469 mile trip across some of the most hostile waters the Great lakes have to offer. But such a journey is exactly what a tough little 11-foot power catamaran recently accomplished. An 11-foot, four-inch CraigCat®, piloted by Adam Gursoy and Trevor Baykowski, recently launched from Grand Haven Michigan, on that state's west coast on Lake Michigan. 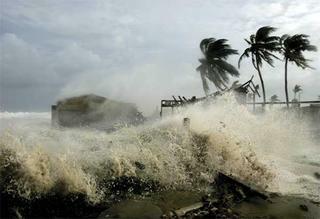 AMAZING TRUE STORY ABOUT A LOVELY COUPLE, A CRAIGCAT®, AND SOME VERY VIOLENT STORMS AND HURRICANES! 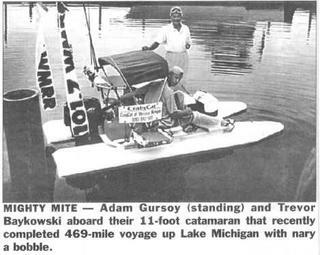 We acquired our CraigCat® late in 1991, as a novelty item. For many years after that it was just that  an electric water novelty used for everything from a fishing platform to a floating raft and diving board for the kids. We have also had it in all of our local custom events like "Anything But A Boat Float" and "Christmas On The River" where all of the boats are decked with Christmas themes and lights. YANKING & BANKING WITH THE CRAIGCAT® by Sports Boat & RIB Magazine, U.K. When Alex asked me to go and have a look at the CraigCat®, to be honest, after his description, I was totally flummoxed!  "Two surfboards attached to each other with an engine," is roughly what he said, so I am relieved to report that the CraigCat® is far more than that.